Join the discussion on our forums! 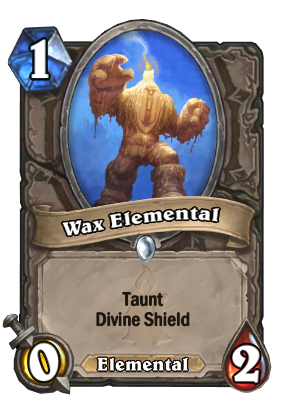 Come discuss Wax Elemental over in our dedicated Wax Elemental discussion topic. The most powerful drop ever in turn 1, no joking. About all it's good for is pulling damage for a turn or two, but it does this very cheaply. People underestimate how much dmg this can soak up for 1 Mana. l am a vegan elemental. So what is he going to shout when you play him? "You no take me!" Quest Rogue plays Target Dummy in wild and this might be better, still a bad deck. Great card in buffs lists in general too. Tar is an element. Why not. Maybe it could fit in an Elemental Handbuff Paladin? Think the question to be asked here is, how valuable and viable would a 1/3 Divine Shield with Taunt be (that would be the avarage buff it would recive)? I'm of course talking about a Prince Keleseth deck. However, when drawn before Prince it's almost "a nothing" of card. It could perhaps become something if you combo with the new Legendary Paladin Weapon Val'anyr (bit far stretched). Even when buffed, 3-4 times. I'm not sure you want a card to sit in your hand for that long. Still, with all that mixed potential I still can't see it to out-value some other cheap minions from the new set (and old). Righteous Protector is much better for that niche, and isn't a completely dead draw when you don't get handbuffs. Have both and run Small-Time Recruits. @Eca Why not run both. Some sort of aggro hand buff list.